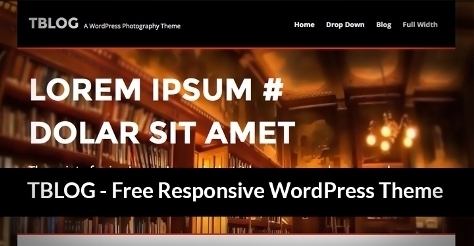 Almasi is a free wp theme. 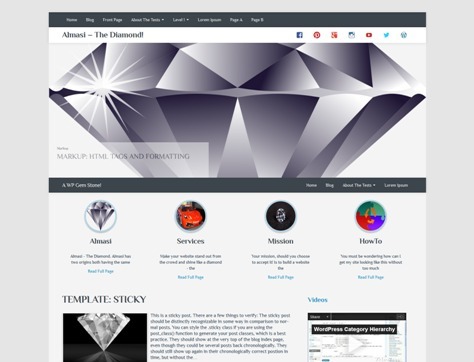 Make your WordPress website sparkle with Almasi polished with awesome content, images and videos all wrapped with a touch of topics you care about. Features are 2 Widget areas on Sidebar, 3 Custom Widgets, Custom header below top menu, Grid Featured Content and more. 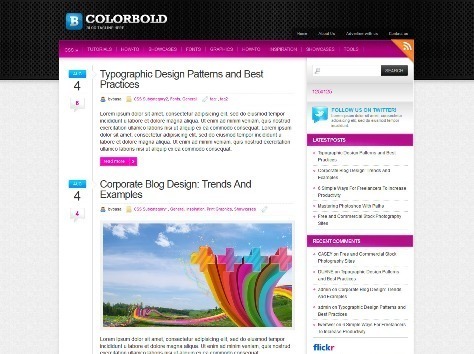 Colorbold is a WordPress Colorful Theme for your blog. 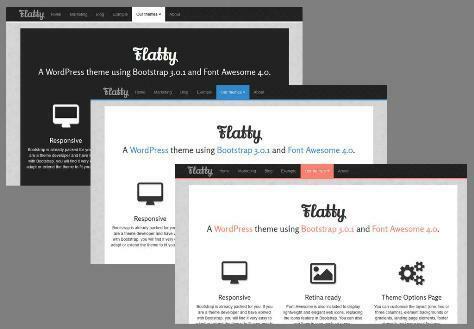 The theme comes with 3 color styles. 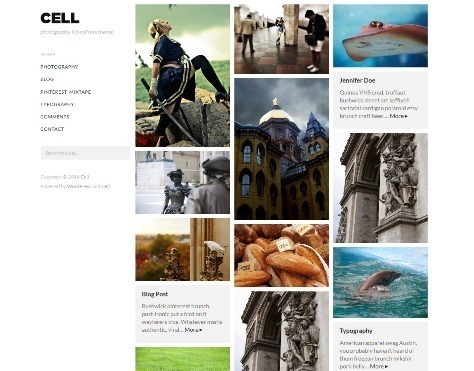 Shells is a free wordpress blog theme with 2 columns and Right sidebar. 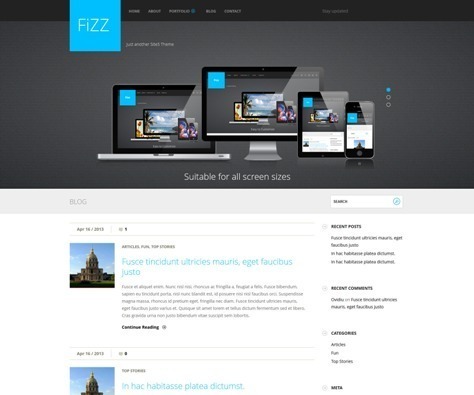 Fizz is a simple and free responsive wordpress theme for personal or corporate blog with Customizable fonts and Easy to Customize. 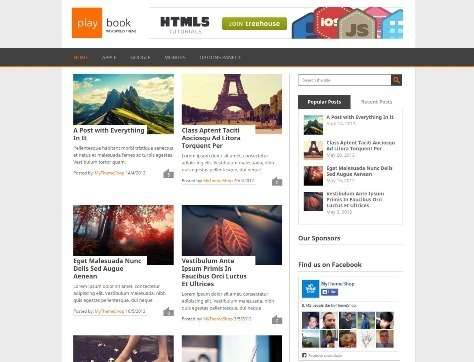 WP Anniversary is a free Anniversary/Thank you WordPress Theme. 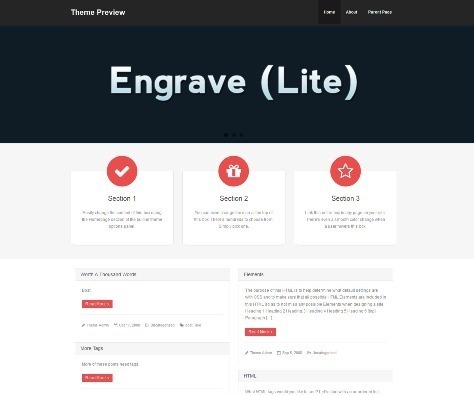 Engrave Lite is the free multi-purpose wordpress theme, ideal for a business or blog website. 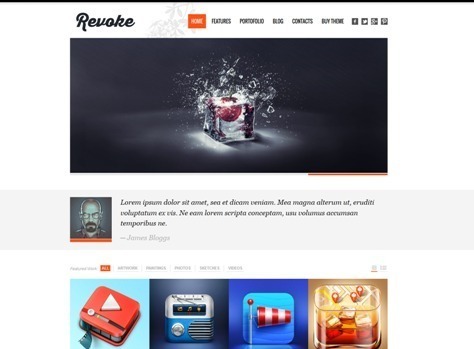 The theme has a responsive layout, powerful theme options panel, retina ready. The theme also comes with a full width easy to use slider. 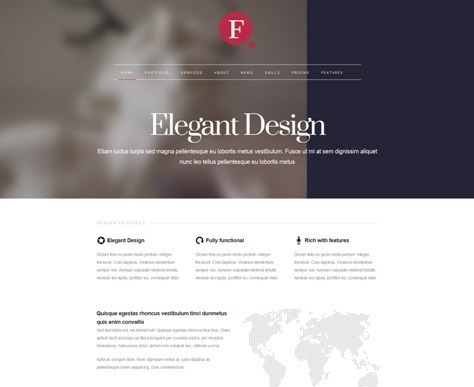 Finale is a elegant and stylish responsive wordpress theme with its minimalist approach your visitors/readers will have a wonderful time reading your messages and or blog posts. This theme is packed with a theme options so you can fully customize the design, including changing the logos, uploading a default header image or choosing a default color even setting up your social media icons and so much more! 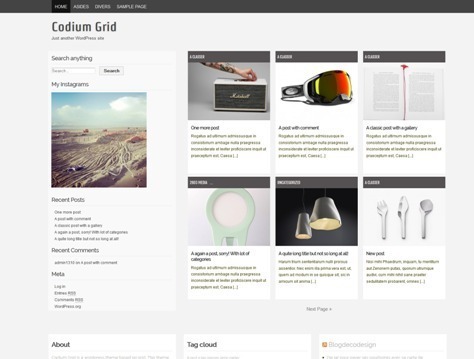 Codium Grid is a wordpress theme based on a grid and fully responsive. 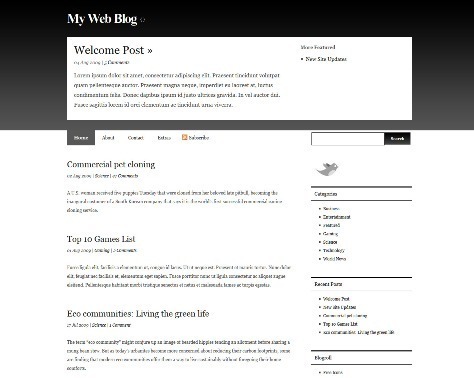 The theme respects the W3C as well as for HTML CSS. The theme is minimalist with the aim to highlight your content. 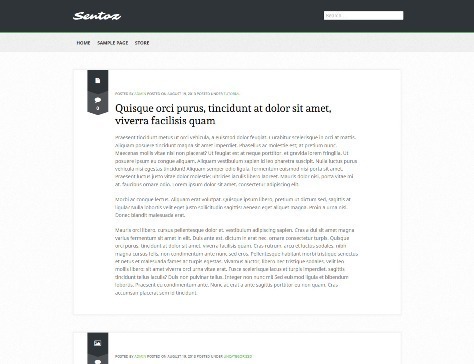 Sentoz – free premium tumblog style WordPress theme. The theme uses WordPress post format feature to create posts with different formats like, image, audio, video, link, aside, gallery, quote etc. 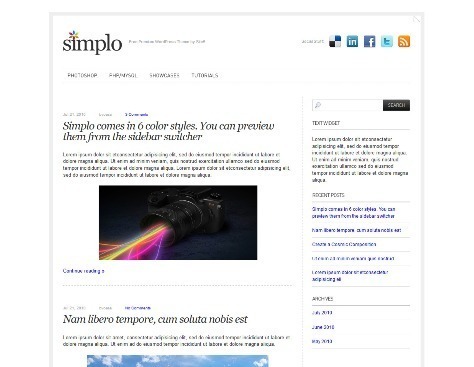 Simplo is a simple and clean free WordPress Blog Theme with 6 color styles. 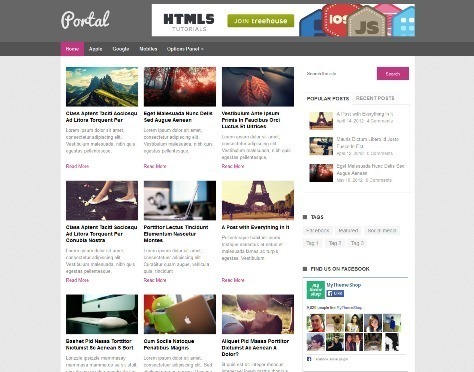 Polaris is a simpe that are suitable for personal and business site. 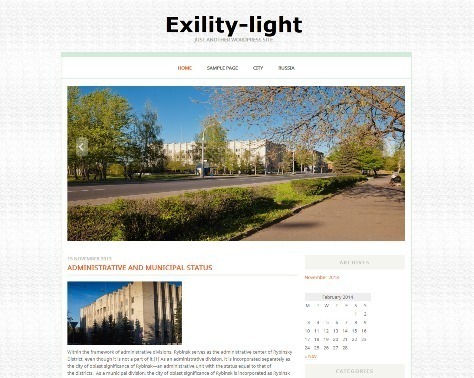 Polaris has 12-Column Grid, 15 Widget Areas for Custom Layout, Multi-Column Recent Post with Thumbnail, Tabbed Site Navigation, Full Width Page, Featured Home, Search Engine Friendly and more. 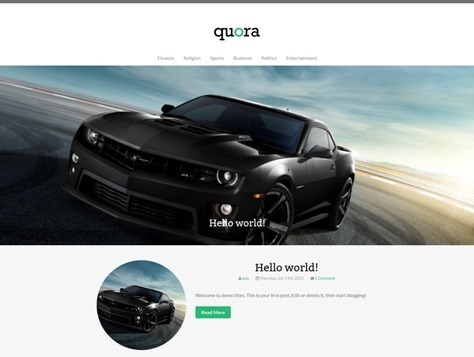 Quora is a free premium WordPress theme with custom menu, featured images, widgetized sidebar, option panel, customizable jQuery content slider and more. 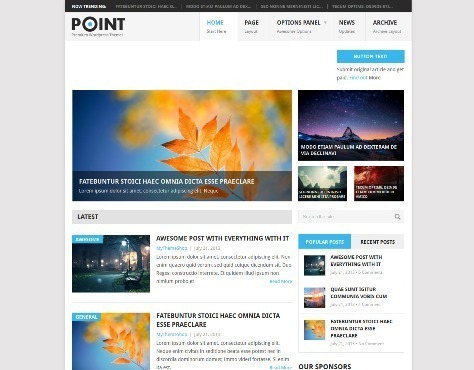 Avante is a free WordPress theme and suitable to use for any kind of website. 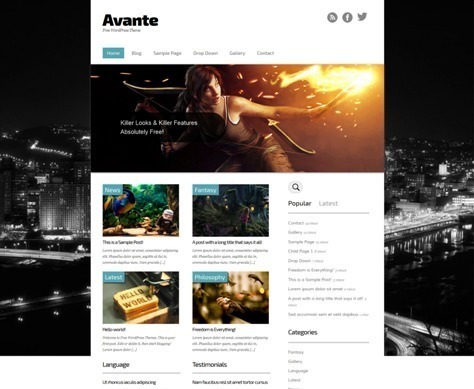 Avante theme features are modern design, fixed width layout, typography, widget ready, theme option panel, homepage slider, fancybox lightbox for galleries and more. 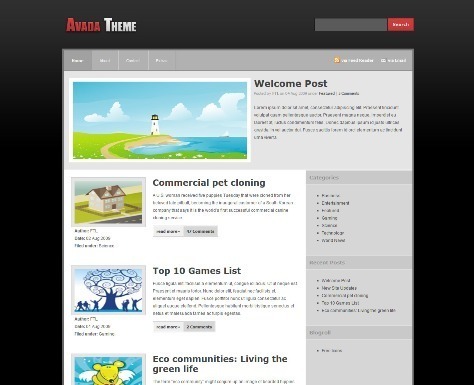 GameTown is a free WordPress Game Theme. 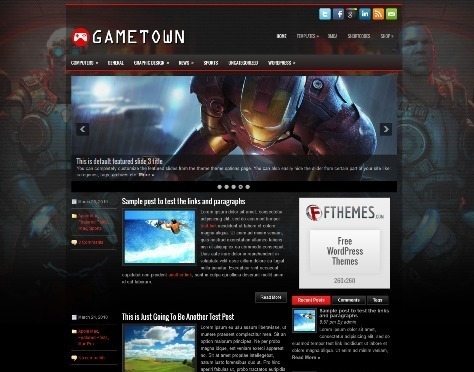 GameTown theme comes with Responsive Design, Widgets Ready, Custom Widgets, Shortcodes, Theme Options, SEO Optimized and more. 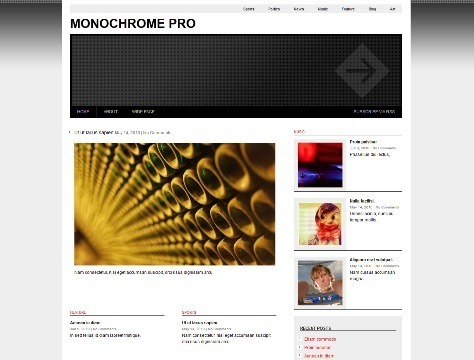 Monochrome Pro is a free WordPress news or magazine Theme. Features are Page Templates, Modern Browsers, Theme Options, Widgets, Translation-Ready, Menus, Custom Backgrounds and more. 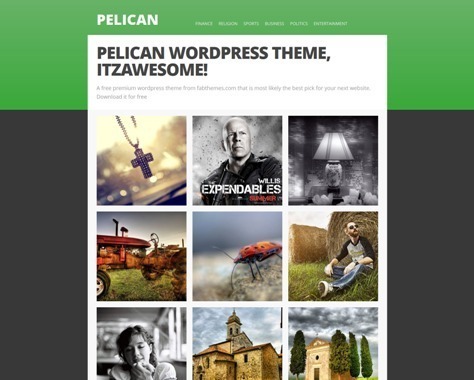 Pelican is a free premium WordPress theme with custom menu, Custom welcome message box , widgetized sidebar, jQuery image gallery and more. 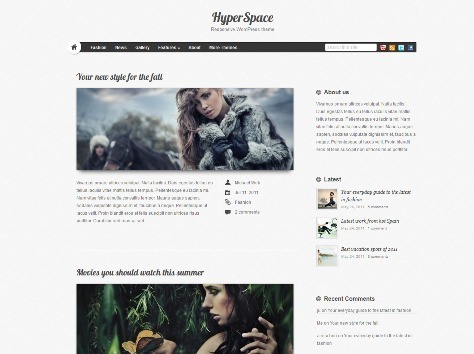 HyperSpace – Clean blog oriented theme with smart gallery feature and exclusive UFO widgets. Features are Responsive Design, Shortcodes, Cross Browser Compatible, Custom Widgets, Theme Customizer, Theme Localization and more. 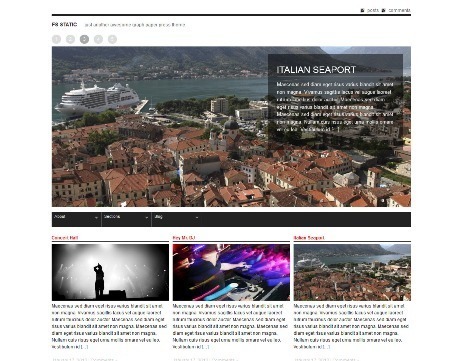 TopTravel is a free WordPress Theme for Travel. TopTravel theme has Responsive Design, Custom Widgets, Shortcodes, Featured Posts Slider, Localization Ready, SEO Optimized, Compatible with all major browsers and more. 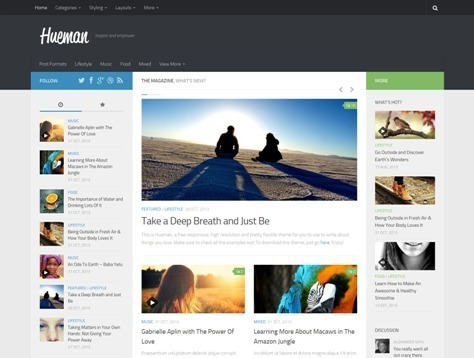 Downtown is a free wordpress theme with a nice color scheme and beautiful design. 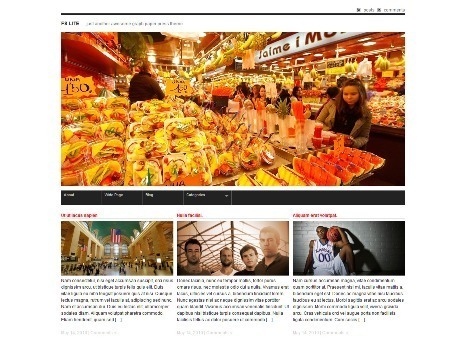 Berlin is a free WordPress theme for news magazine website. 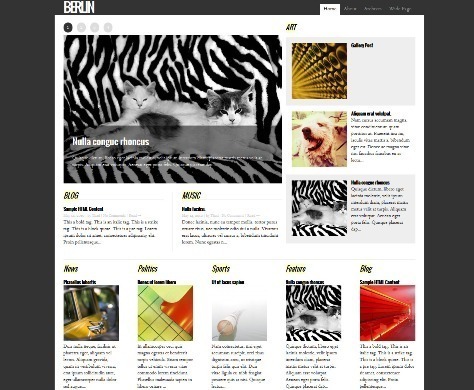 Berlin theme comes with Page Templates, Modern Browsers, Theme Options, Widgets, Translation-Ready, Menus, Custom Backgrounds and more. 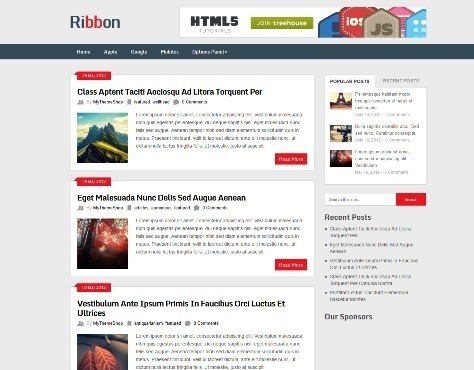 Ribbon is a free WordPress magazine theme with a Dual color scheme, Responsive, Custom Widgets, HTML5 & CSS3, Options Panel, Translation Ready, Related Posts, Unlimited Backgrounds and more. 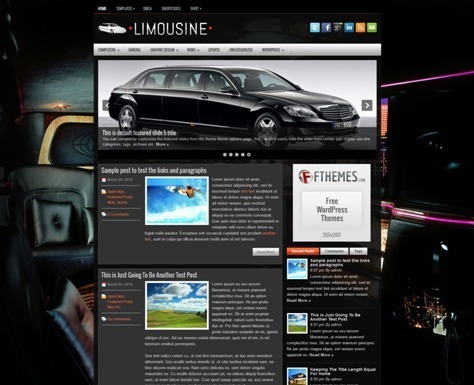 Limousine is a simple free WordPress theme. Features are Responsive Design, Shortcodes, Widgets Ready, Custom Widgets, Compatible with latest WordPress versions, Featured Image Ready, SEO Optimizedy, Compatible with all major browsers and more. 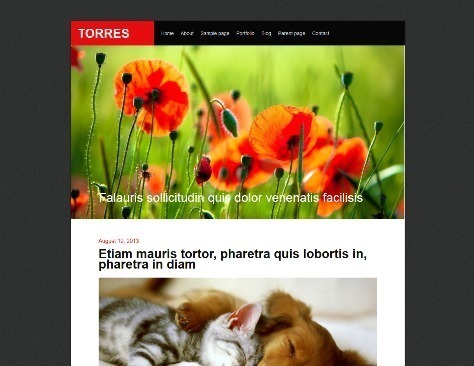 Torres is a free premium theme suitable for artists, photographers, journals etc. 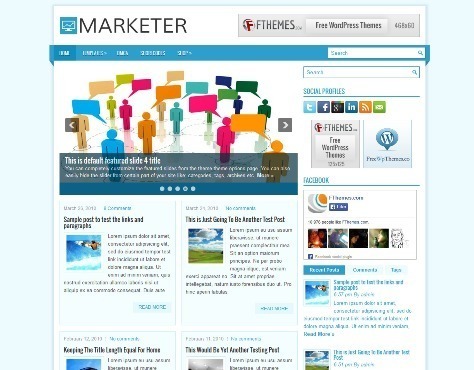 The theme is wordpress 3.6 compatible and the homepage of the theme features a large flexslider section. 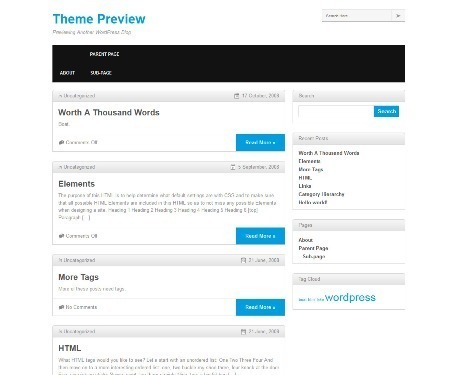 The footer of the theme consists 3 different widgets section. 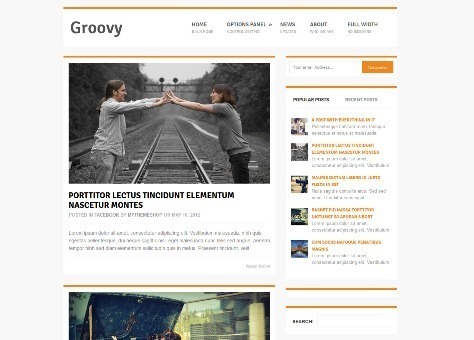 Groovy is a magazine style WordPress theme. Features are Responsive Layout, Faster Loading, Custom Widgets, SEO Optimized, Options Panel, Related Posts and more. 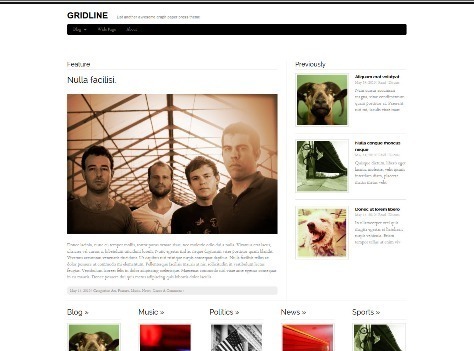 Gridline is a news magazine theme with Page Templates, Modern Browsers, Theme Options, Widgets, Translation-Ready, Menus, Custom Backgrounds and more. 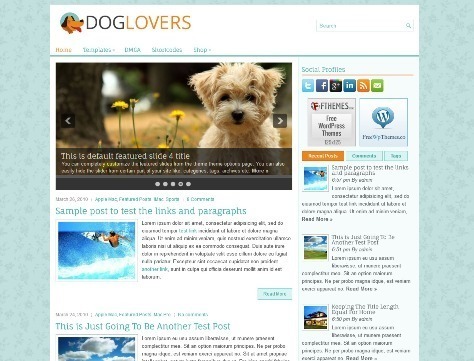 DogLovers – free WordPress theme for Pets. Features are Featured Posts Slider, Responsive Design, SEO Optimized, Custom Widgets, Localization Ready, Compatible with all major browsers, Contacts Page Template, Theme Options and more. 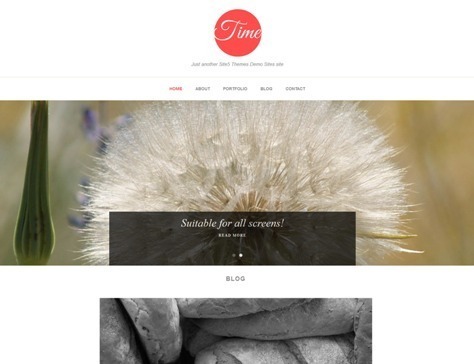 Time is a clean responsive free wordpress theme for personal blogs. 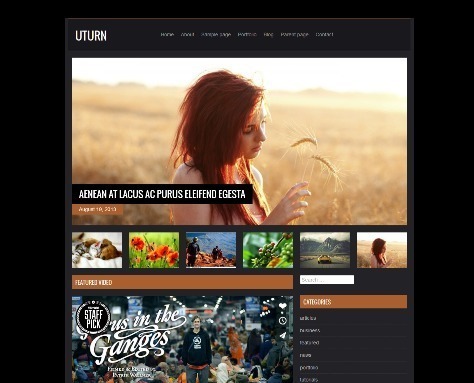 Uturn is a free premium WordPress theme for portfolio, game blogs, video blogs etc. 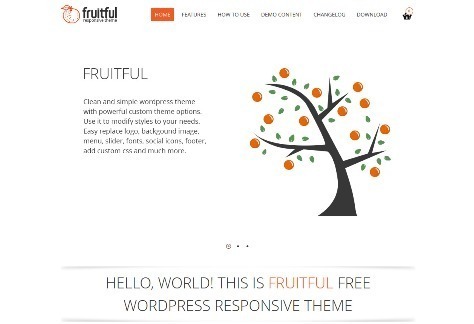 This is a WordPress 3+ ready theme with features like custom menu, featured images, widgetized footer, option panel, customizable jQuery content slider and a featured video section. 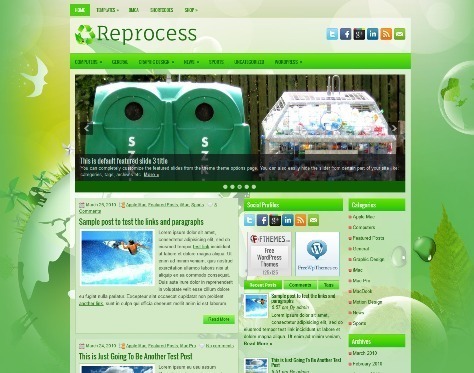 Reprocess utilises the latest technologies in WordPress including custom menus, backgrounds and featured images. This fantastic recycle theme boasts easy-to-use admin options and widgets. 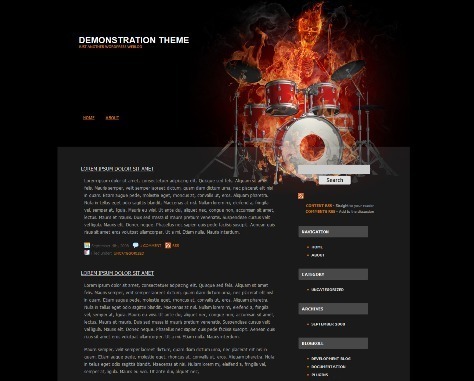 Drums is a free WordPress Music Theme with 2 columns and Right sidebar. 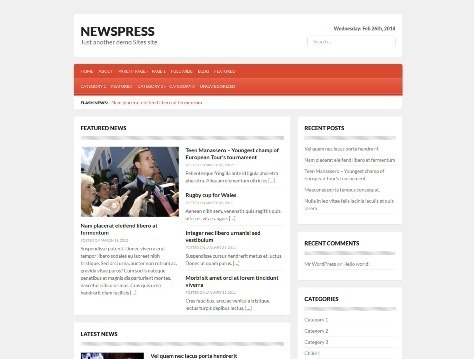 Newspress is a minimalist news magazine wordpress theme with 2 custom menus, featured images, featured news section, Flash news ticker, theme options, widgetized sidebar and footer. 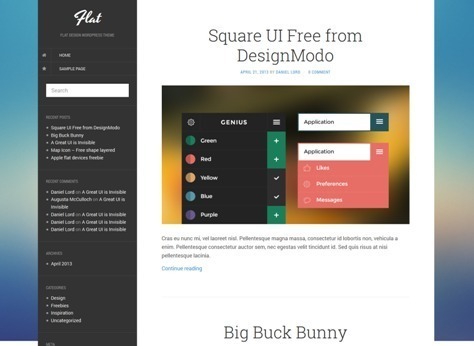 Flat Blog – Free Flat WordPress Theme for Personal Blog. Features are Flat Design, Fully Responsive, Twitter Bootstrap 3.1.0, Compatible up to WordPress 3.8, HTML5 / LESS, Font Awesome 4.0.3, Off-Canvas Sidebar and more. 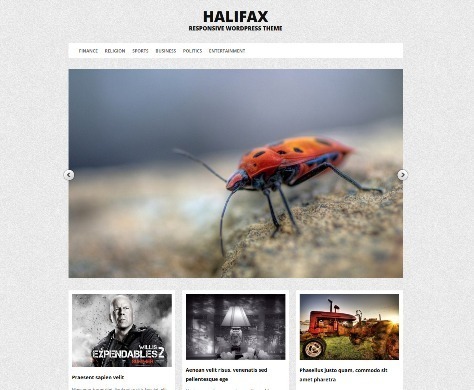 Halifax – WordPress 3 ready theme with responsive layout, masonry layout on the homepage. 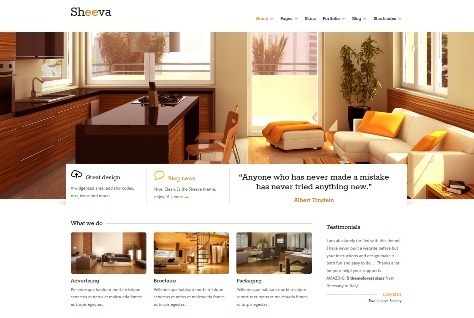 The theme is feature rich with most latest WordPress features. 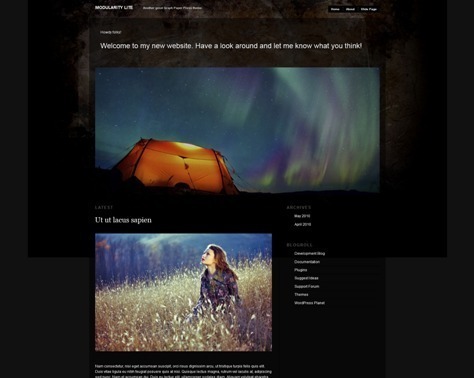 TheHunter is a sleek hinting theme for WordPress. 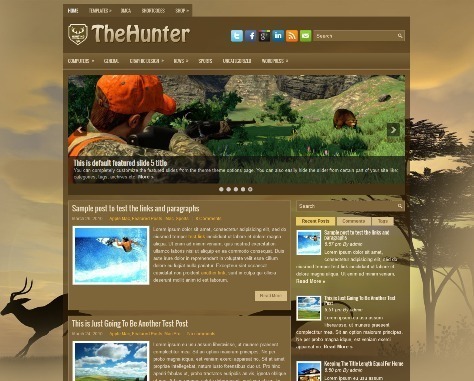 TheHunter theme features are Responsive Design, 4+ Custom Page Templates, Compatible with latest WordPress versions, Shortcodes and Shortcode Generator in the editor, Widgets Ready, Custom Widgets, SEO Optimizedy and more. 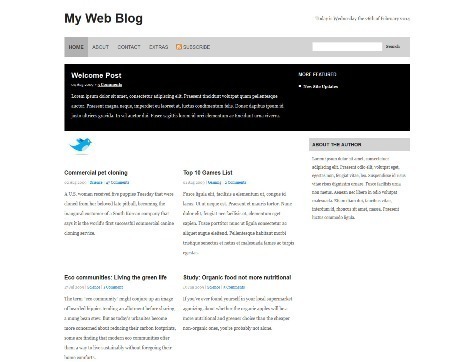 This is a 2 column minimalist blog theme for personal blogs or journal websites. 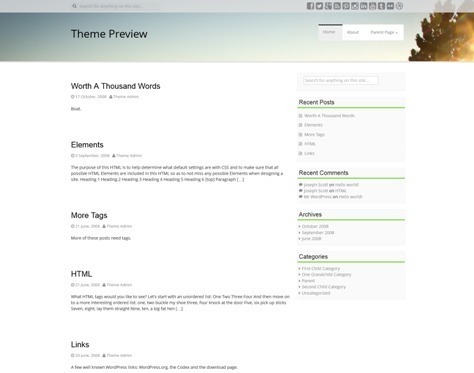 The theme has features like, custom menu, featured thumbnails, Custom background, theme options, google fonts, etc. 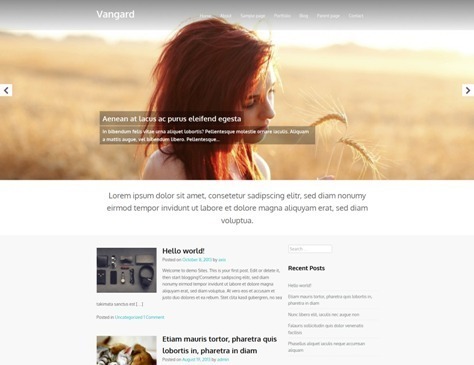 Avada is a free WordPress Theme with Widget Ready, Photoshop PSD Files Included, Works with latest WordPress release and more. 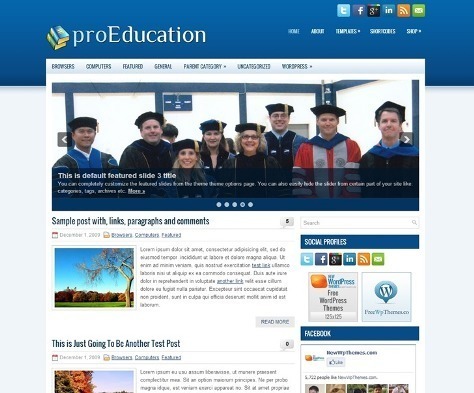 proEducation is a free WordPress Theme for Education. 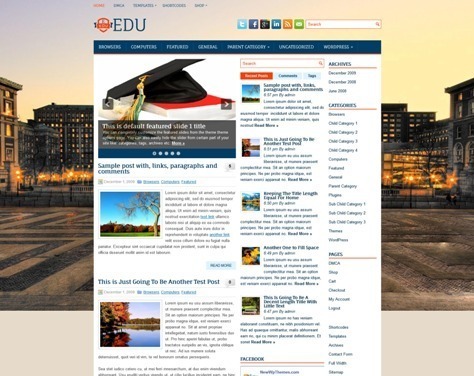 proEducation theme comes with Featured Posts Slider, Responsive Design, SEO Optimized, Custom Widgets, Localization Ready, Compatible with all major browsers, Contacts Page Template, Theme Options and more. 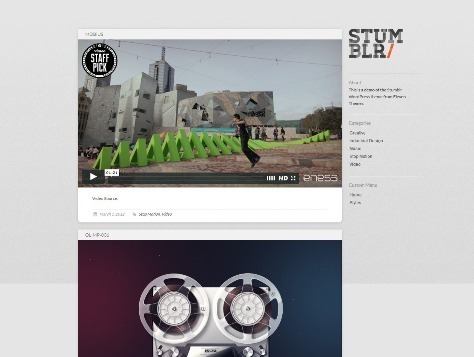 Stumblr – A free Tumblr style WordPress theme ideal for Microblogging photos and video. 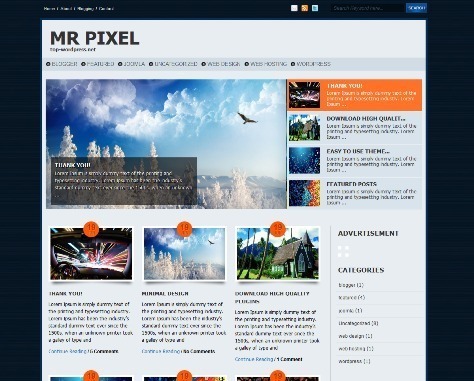 Features are Minimal Design, Widgetized Sidebar and Footer, Featured Images, 2 Colour Schemes, Simple Options Panel, Logo upload option and Optimised for Video. 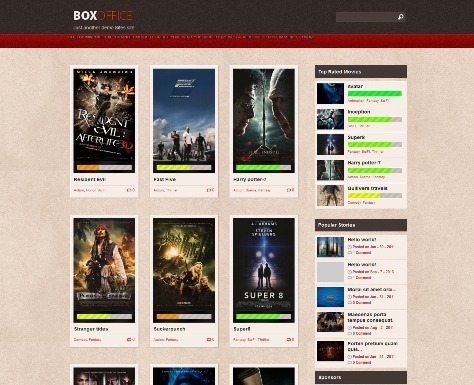 Boxoffice is a movie review free WordPress Theme with WordPress 3 ready, Custom post types, custom taxonomies, custom metaboxes, Theme option panel, Featured thumbnails, Banner ads, Prettyphoto enabled videos, Widgetized sidebar, Featured thumbnails and more. 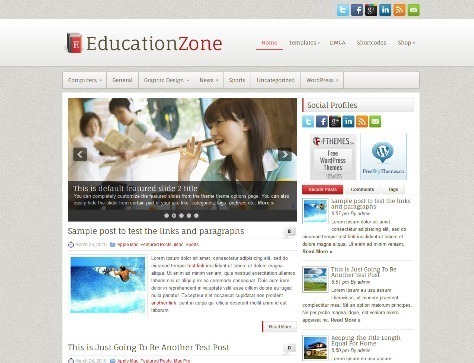 EducationZone is perfect for those looking for an education website or blog. 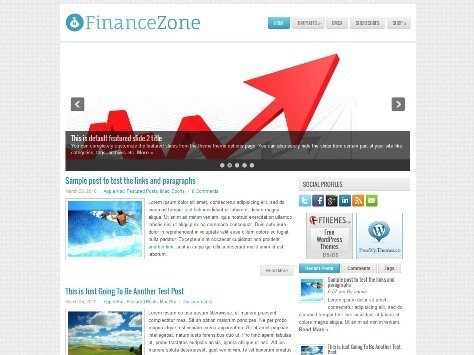 EducationZone theme features are Responsive Design, SEO Optimized, Compatible with latest WordPress versions, Featured Image Ready, Shortcodes, 4+ Custom Page Templates and more. 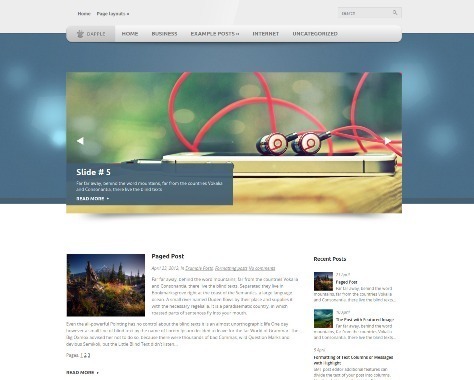 The Edu theme is a education themes for WordPress. Features are Responsive Design, SEO Optimized, Compatible with latest WordPress versions, Featured Image Ready, Shortcodes, 4+ Custom Page Templates and more. 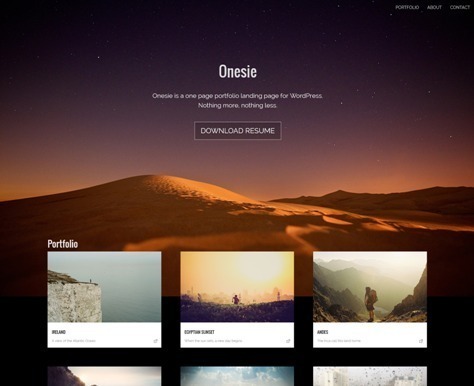 SkyWalker is a free wordpress portfolio theme. Dapple is an easy way to make your site attractive and usable for your visitors. The theme comes with easy-to-use administrative panel and lots of configurations provide a great base to build on. 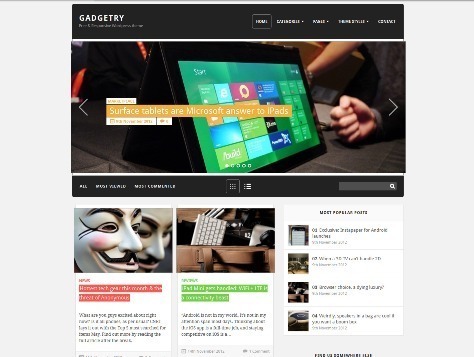 Gadgetry – A Free WordPress theme with a clean and modern style, best suited for blogging or small magazine websites. Gadgetry has Responsive, One click auto install, Built-in SEO and Marketing. 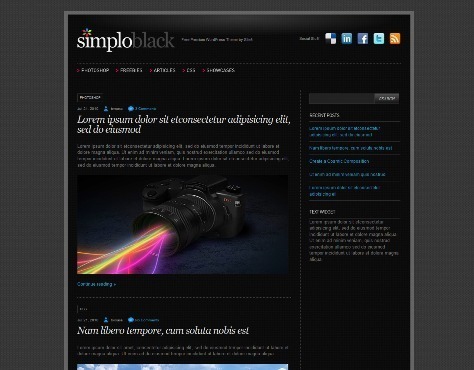 SimploBlack is a Simple dark and clean blog free wordpress theme coming with six color styles. 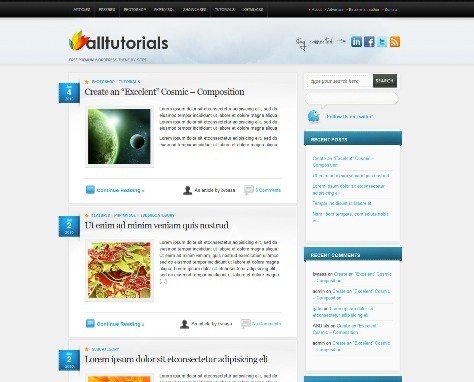 Emptilium is a 3 columns responsive HTML5 WordPress theme. Features are Unlimited Color Choices Settings, Responsive, 600+ Google Web Fonts, Localization Ready, Featured Article Slider, Logo and Favourite icon setup and more. 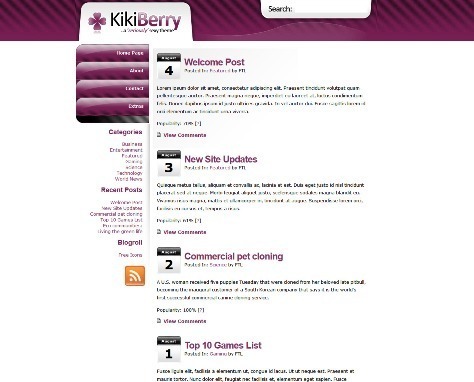 Kikiberry is a free WordPress Theme with Widget Ready, Photoshop PSD Files Included, Works with latest WordPress release and more. 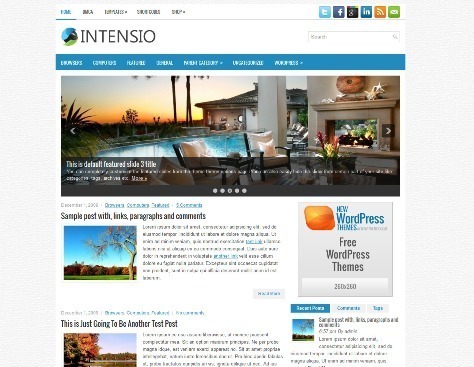 Intensio is a free WordPress Theme with Responsive Design, SEO Optimized, Compatible with latest WordPress versions, Featured Image Ready, Shortcodes, 4+ Custom Page Templates and more. 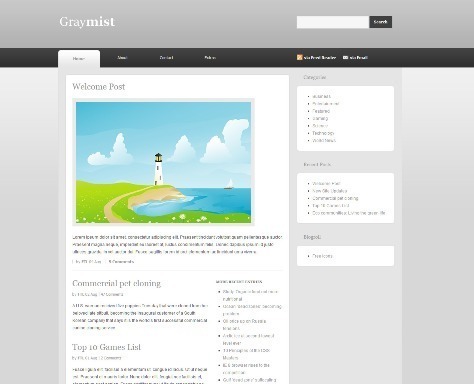 GrayMist is a free WordPress Theme with Widget Ready, Photoshop PSD Files Included, Works with latest WordPress release and more. 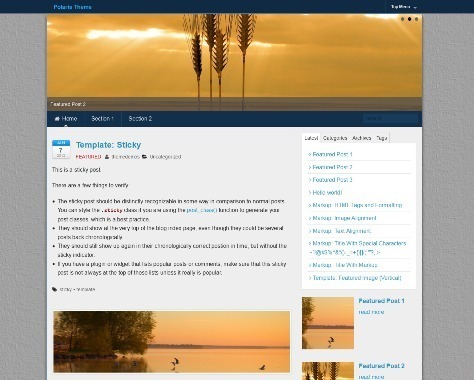 EducationPress is a free WordPress Theme for Education blog. EducationPress theme comes with Responsive Design, Shortcodes, Featured Posts Slider, Custom Widgets, Shortcodes, Contacts Page Template, SEO Optimized and more. Love WP Theme – A free dating wordpress theme with a special 404 page settings, footer content, widget ready with 6 extra widgeted areas besides the sidebars, rss ready, gravatar ready, xhtml & css valid, crossbrowser compatible working with the last version of WordPress. 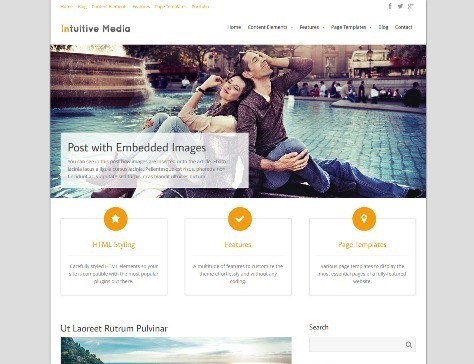 LucentView is a free WordPress Theme with Widget Ready, Photoshop PSD Files Included, Works with latest WordPress release and more. 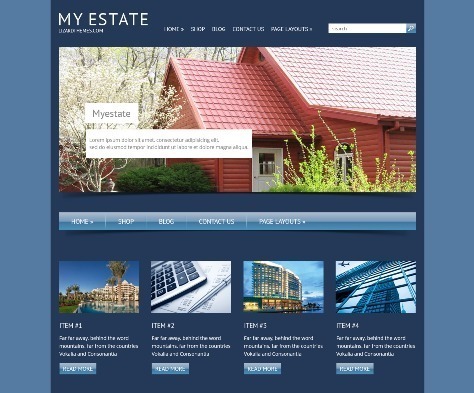 MyEstate – This free theme suitable for personal websites, blogs, community building websites and much more. There is no longer need to hire an expensive designer and web-developer to construct your website for you. 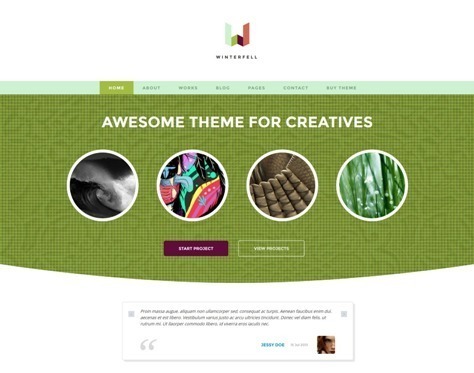 InterStellar is a Clean and responsive free wp theme with multiple portfolio page layouts, homepage slider, widgetized homepage, theme options and much more. 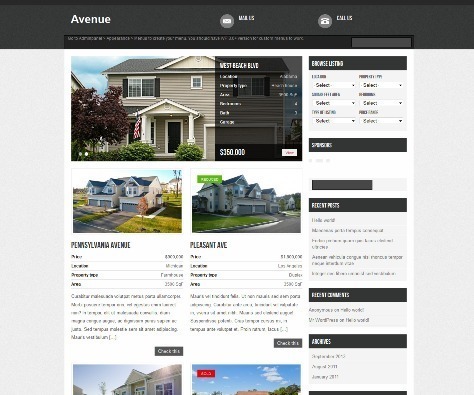 Avenue is a free real estate wp theme. 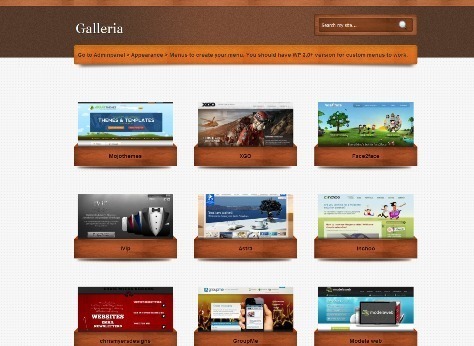 This theme is fully loaded like any premium real estate theme out there. The theme comes with wordpress features like Custom post types, custom menus, custom taxonomies, Custom meta boxes, featured thumbnails, Theme options etc. 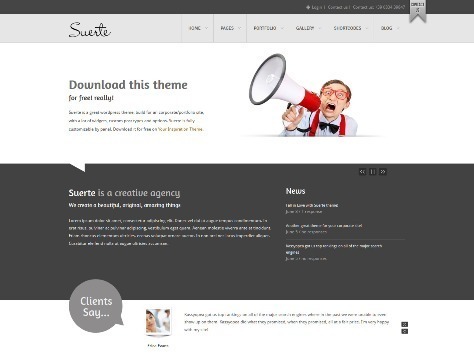 Suerte is a free wordpress theme built for corporate, portfolio site or personal blog. UpRight is a free WordPress Theme with Widget Ready, Works with latest WordPress release, Photoshop PSD Files Included and more. 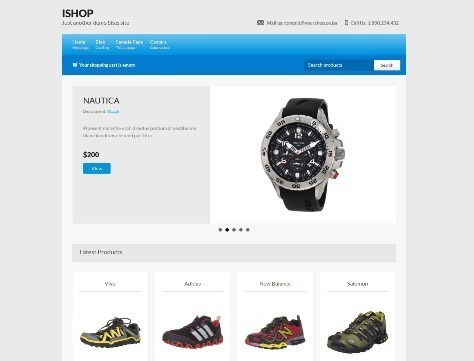 iShop is a free ecommerce WordPress theme. This theme uses the cart66 lite plugin to power the ecommerce aspect of the theme. 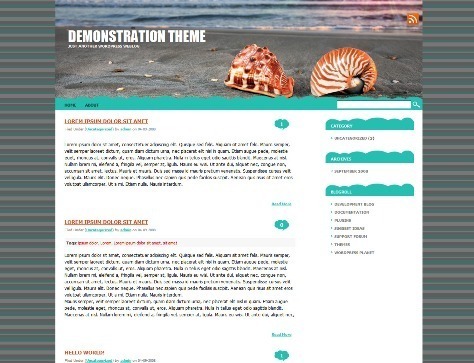 The theme comes with other features like, custom menu, custom post types, custom taxonomy, featured images, custom homepage, jquery content slider, theme options etc. 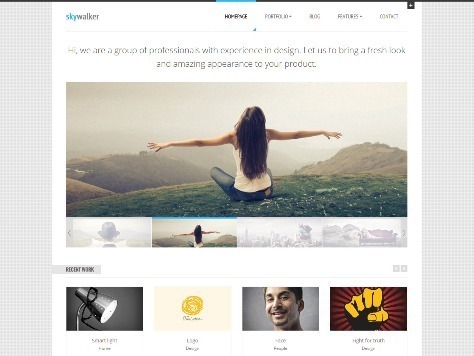 Design Portfolio is a free wordpress theme for portfolio. 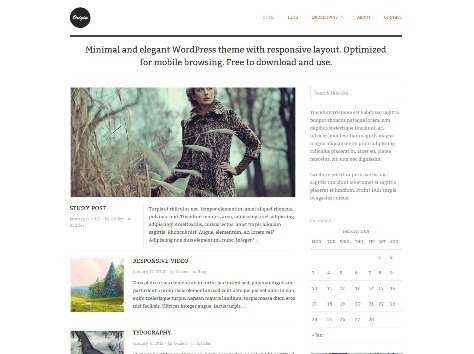 Jovan is a free wordpress theme with 2 Columns, Adsense Ready, Fixed Width, Right Sidebar and Widget Ready. 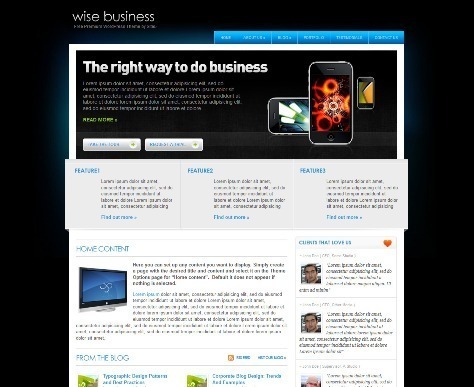 WiseBusiness is a free wordpress theme for blogs, portfolios, for all kind of businesses. 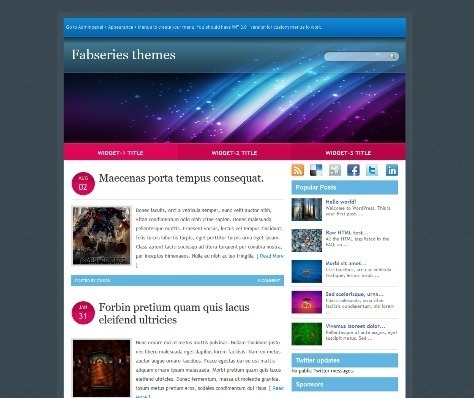 Galleria is a free wordpress theme. 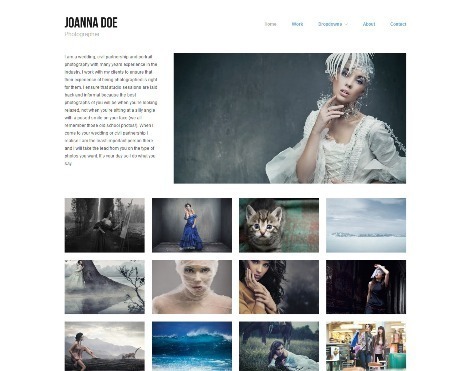 This theme is built to transform your wordpress blog to a css gallery site. 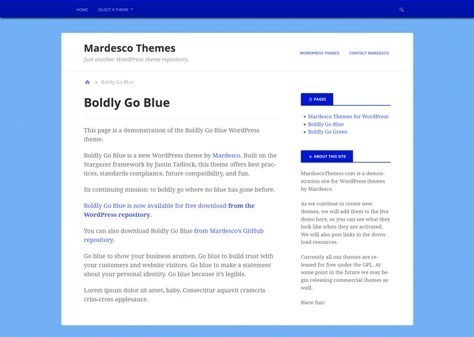 A bold blue WordPress theme, made by Mardesco. it’s an excellent choice for a business or professional website. Features are Responsive Layout, Custom Menus, Widget Ready, Bold Yet Clean Design, Custom Background and more. Horcrux is a free wordpress theme with 2 Columns, Adsense Ready, Fixed Width, Large Footer, Right Sidebar and Widget Ready. 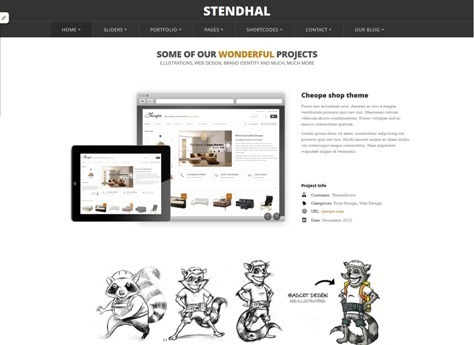 Stendhal is a clean and powerful corporate and portfolio theme with a lot of portfolio features and unlimited design options, 5 slider types, Unlimited Colors, Custom Widgets, Shortcode manager, 600+ google fonts, Unlimited Contact Forms and more. 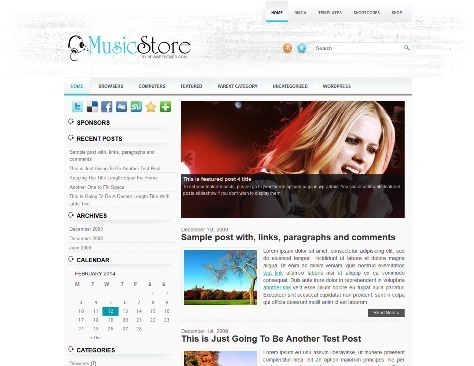 MusicStore is a free premium WordPress theme Suitable for any shopping, fashion and entertainment web sites with 2 Columns, Adsense Ready, Fixed Width, Right Sidebar, Widget Ready and more. 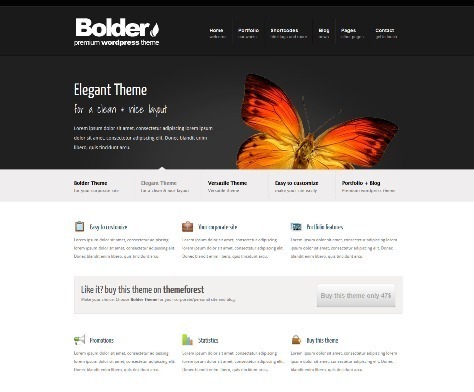 Bolder is the perfect WordPress theme for your business, blog or portfolio websites. Bolder has 15 different skins, 3 different sliders, 3 portfolio pages and a sleek professional design. Bolder is fully customizable through the specific theme option panel. 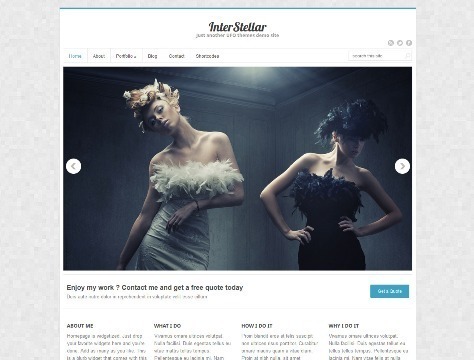 JustBlue is a Free Premium Responsive WordPress Magazine Theme. 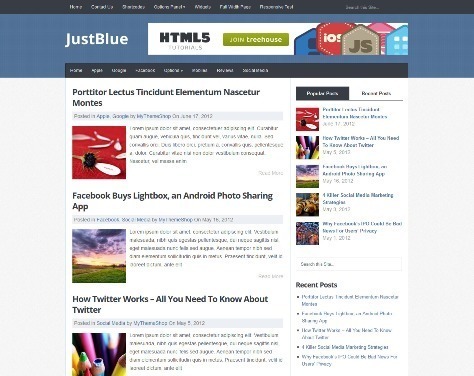 JustBlue theme features are Responsive, Speed, Related Posts, Custom Widgets, Options Panel, SEO Optimized and more. Impero is a free WordPress Theme built with simple and responsive design for your corporate, portfolio site or your personal blog. Features are Extensive Theme Options, Unlimited Colors, 600+ google fonts, Unlimited Contact Forms, 4 portfolio layouts, Custom Widgets, Shortcode manager and more. Oxygen – A professional magazine theme with responsive layout for enhanced mobile browsing experience. Features are Fluid, responsive layout, Advanced widgets, Featured content slider, Breadcrumbs, Lightbox, Translation-ready, 3 Menus, Custom front page template and more. Di’verso is a fresh and clean multipurpose WordPress Theme, built for your corporate/portfolio site or your personal blog. 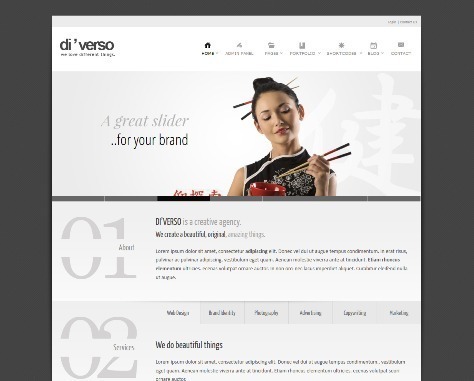 Di’verso has Responsive design, Unlimited Colors, 4 portfolio layouts, 600+ google fonts, Shortcode manager, Custom Widgets, Unlimited Contact Forms and more. 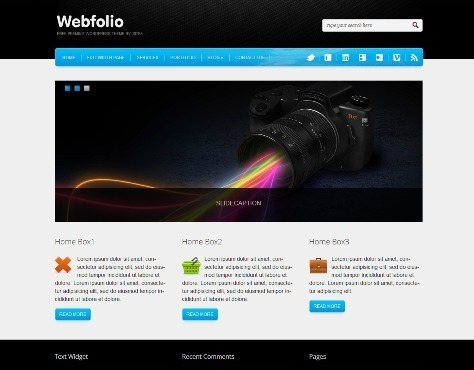 Webfolio is a free wordpress theme with 3 color styles for blog and portfolio showcase. Memento is a WordPress creative theme, the perfect choice for company’s web projects thanks to its clean, corporate and responsive design. Seo Optimized, powerful and with a lot of options, with Memento you can create unlimited skins for your web project and different web sites with just one theme. 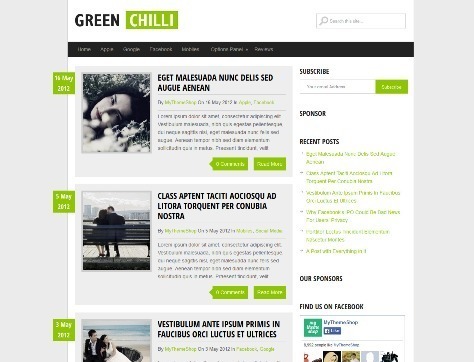 GreenChilli is a Free WordPress Theme For Bloggers. 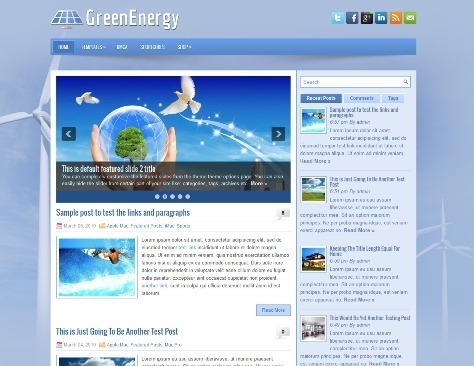 GreenChilli has Responsive, SEO Optimized, Custom Widgets, Unlimited Color Schemes, Related Posts, Ad Management and more. Pink Rio is a powerful WordPress theme with clean and responsive layout. 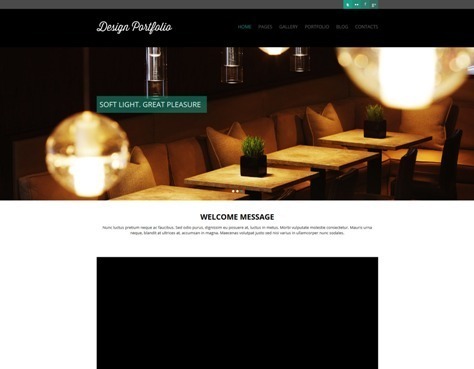 It is suitable for corporate and also for personal portfolios and blogs with the extensive theme option panel and shortcode manager, 5 slider types, 600+ google fonts, Unlimited Colors, Valid XHTML / CSS, Widget ready and more. 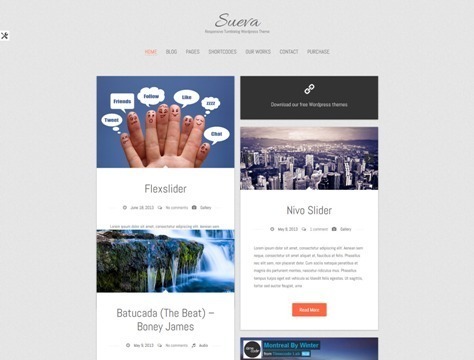 Samarcanda is a multipurpose fullscreen wordpress theme for portfolio, videos and creative perspective. Samarcanda theme comes with about page, testimonials page, services page, gallery, video, portfolio, shortcodes, unlimited colors, background uploader, dark and light skins, 5 sliders, 500+ fonts and more. 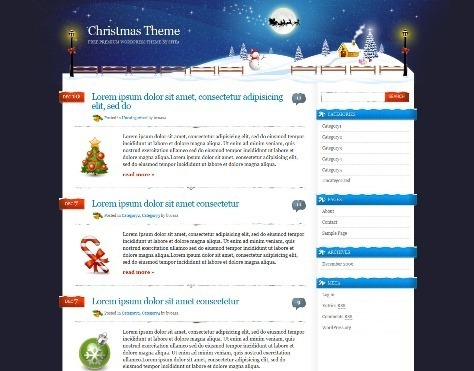 Xmas is a simple free wordpress theme for the winter holidays and Xmas. 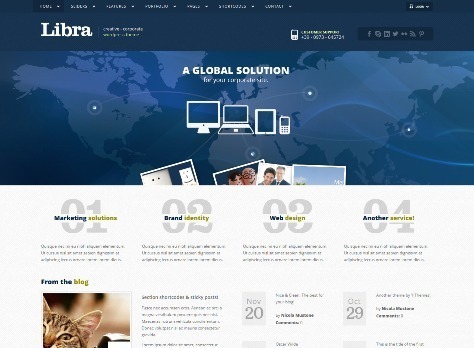 Libra is a free and powerful theme with clean and responsive. This theme is really suitable for a corporate/brandable site and also for personal portfolio and blog. 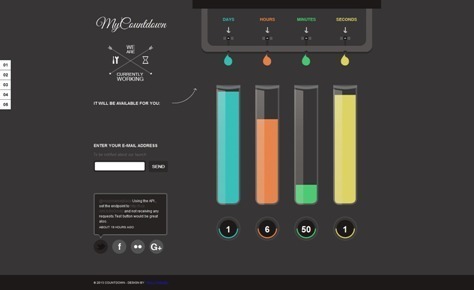 MyCountdown is a Free WordPress Coming Soon Theme. 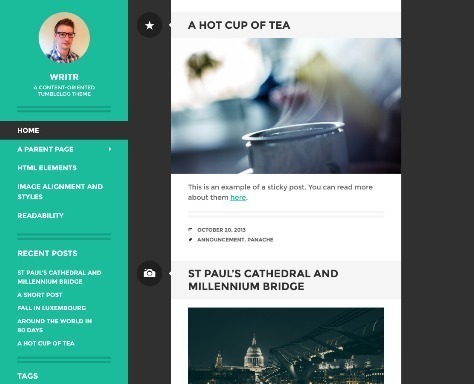 Features are responsive design, shortcodes, custom widgets, google map, custom posts, page templates and more. 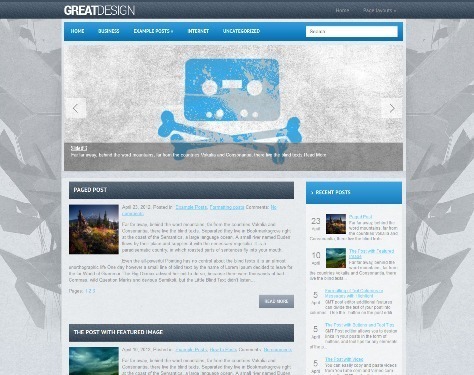 GreatDesign is a Free WordPress Theme. The theme comes with easy-to-use administrative panel and lots of configurations provide a great base to build on. Features: Custom Sidebars, Responsive Web Design, Translation Options, Compatible with latest WordPress versions, Custom Sidebars, Dynamic Content Loader and more. 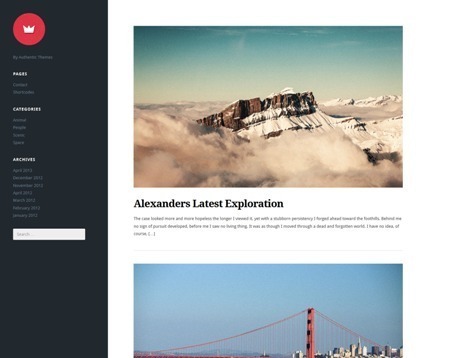 Traveling is a Free WordPress Travel Theme. Traveling theme features are Responsive Design, Shortcodes, Compatible with latest WordPress versions, Custom Widgets, Shortcodes, Contacts Page Template, SEO Optimized and more. 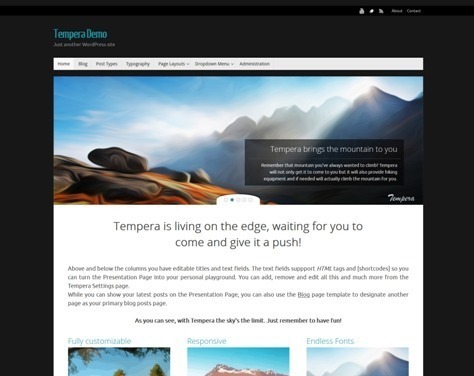 Tempera is a Free WordPress Magazine Theme with Google fonts, Social icons, Responsive, Translation-ready, Widgets and more. 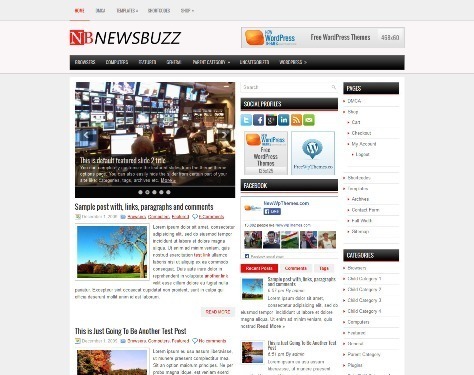 NewsBuzz is a free News/Magazine WordPress Theme with easy to use options page, Upload your logo and favicon, Ready to use custom widgets and featured posts slider and more. 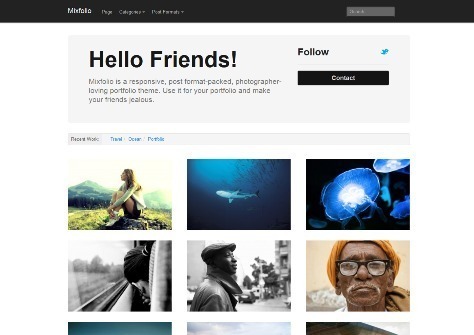 Cell is a flexible free wordpress theme for photography and photo blogging theme. Features are Minimalistic, Responsive, Custom Background, Custom Header, Translation-ready, Child-theme Friendly and more. 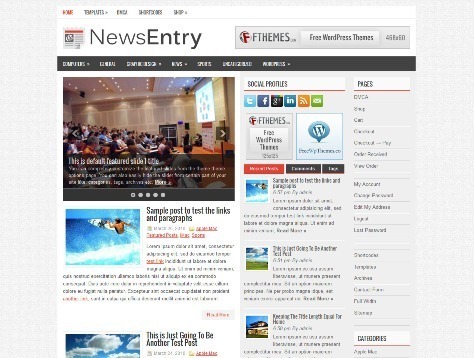 NewsEntry is a free News/Magazine theme for wordpress. 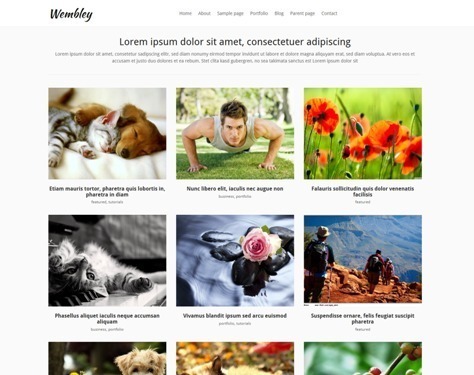 NewsEntry theme features are Responsive Design, 4+ Custom Page Templates, SEO Optimizedy, Compatible with latest WordPress versions, Shortcodes, Widgets Ready, Custom Widgets and more. 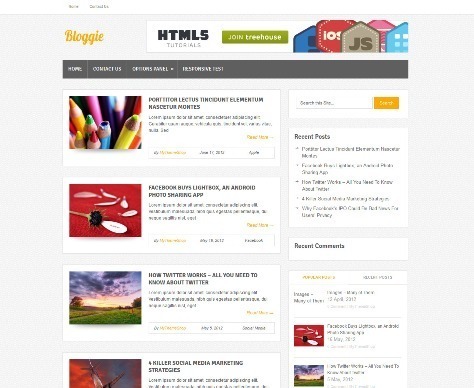 Bloggie is a free WordPress theme in the standard blog structure with Unlimited Color Schemes, Options Panel, Custom Widgets, Speed, SEO Optimized, Responsive, Related Posts, Ad Management and more. SmartCompany free wordpress theme for business and portfolio. SmartCompany has Responsive Design, 4+ Custom Page Templates, SEO Optimizedy, Compatible with latest WordPress versions, Shortcodes, Widgets Ready, Custom Widgets and more. Launcher is a Responsive Free Coming Soon WordPress Theme. 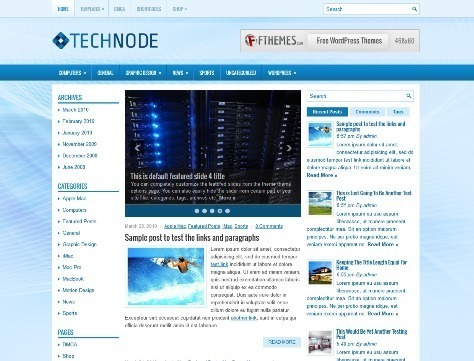 The TechNode is a free WordPress theme for technology sites. This theme comes with Responsive Design, Featured Image Ready, 4+ Custom Page Templates, SEO Optimizedy, Compatible with latest WordPress versions, Shortcodes, Widgets Ready, Custom Widgets and more. 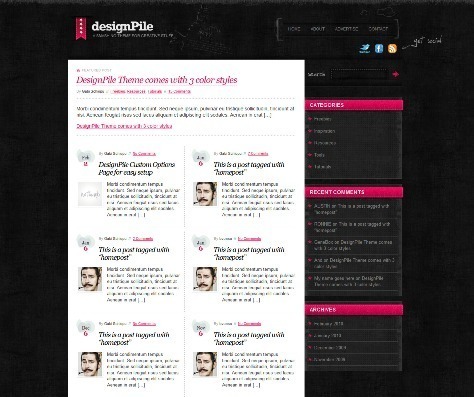 Designpile – Vintage yet clean looking theme for your blog, coming with 3 color styles. 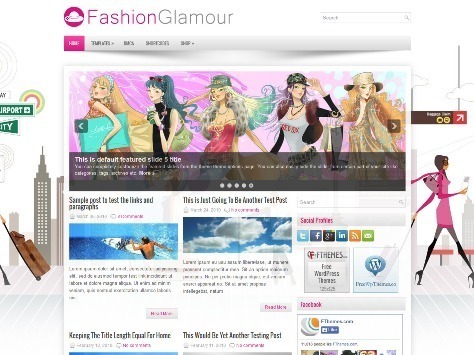 FashionGlamour is a free WordPress theme for fashion website or blog with Responsive Design, Featured Image Ready, 4+ Custom Page Templates, SEO Optimizedy, Compatible with latest WordPress versions, Shortcodes, Widgets Ready, Custom Widgets, Compatible with all major browsers and more. 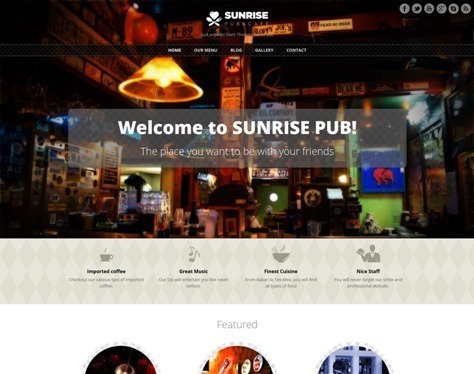 Sunrise is a Free Responsive WordPress Theme for Pubs and Restaurants. 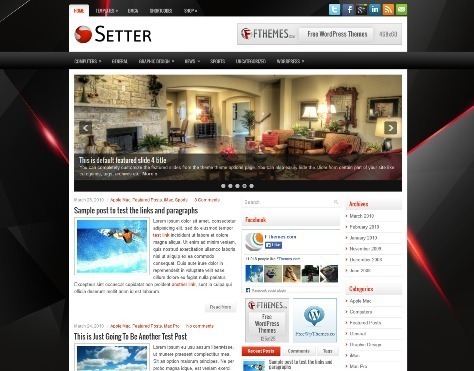 The Setter theme offers a fantastic and professional General/Blog layout. Setter comes with free support, widgets, custom backgrounds and a unique slideshow. 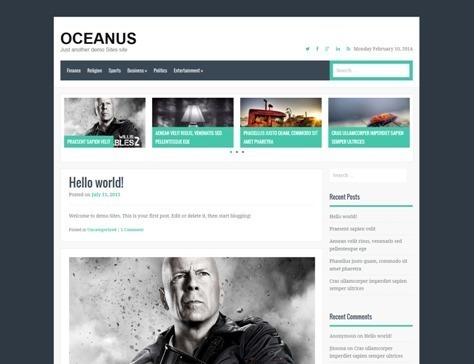 Origin is a free simple and elegant wp theme with responsive layout. The theme comes with Theme Settings, Breadcrumbs, Responsive Layout, Custom Background, Lightbox, Prominent Tagline, Translation-ready and more. 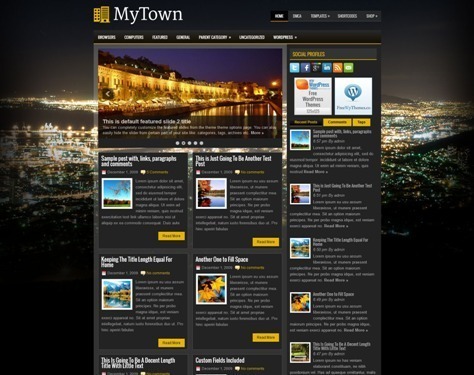 MyTown is a free WordPress General/Blog Theme with easy to use options page,Upload your logo and favicon, custom widgets and featured posts slider and more. 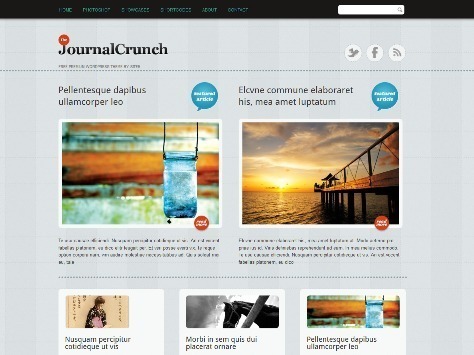 JournalCrunch – A WordPress theme for magazines or portfolios with an integrated journal. Features: Custom background support, Retina ready, Bootstrap 3.0 and Font Awesome 4.1 included, Google Fonts, Custom menu support with three-level dropdowns, Featured images support for posts and pages, Thickbox used to display images, Related articles functionality, Widgets and more. 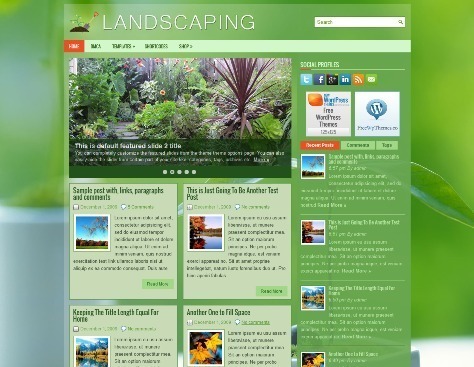 Landscaping is a free WordPress General or Blog Theme with easy to use options page,Upload your logo and favicon, custom widgets and featured posts slider and more. 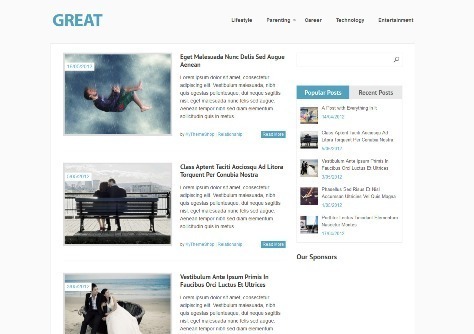 Great is a Free Responsive Magazine WordPress Theme With clean and minimalist design. Features are Custom Widgets, SEO Optimized, Background Image and Color, Responsive, Unlimited Color Schemes, Related Posts, Ad Management and more. 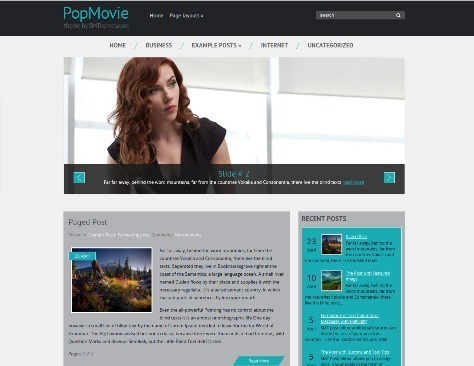 PopMovie WordPress theme is a perfect foundation for cinema website with Easy to use administrative panel, custom widgets, an eye catching related posts and lots of other powerful features provide a great base to build on. 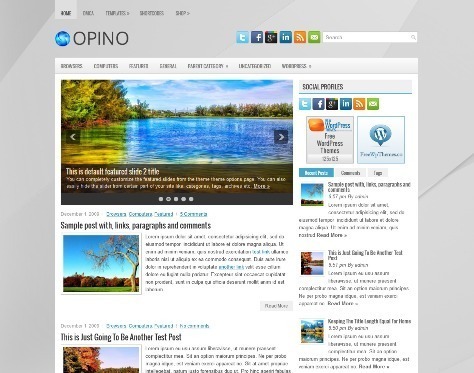 Opino is a free WordPress General/Blog Theme. The Theme Comes with easy to use options page. Upload your logo and favicon. 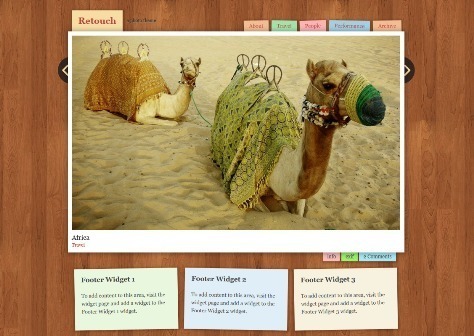 Ready to use custom widgets and featured posts slider. 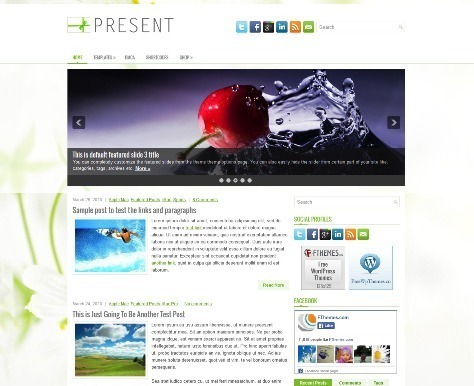 Present is a free wordpress General/Blog theme supports and comes with widgets, drop-down menus and an automatic slideshow. 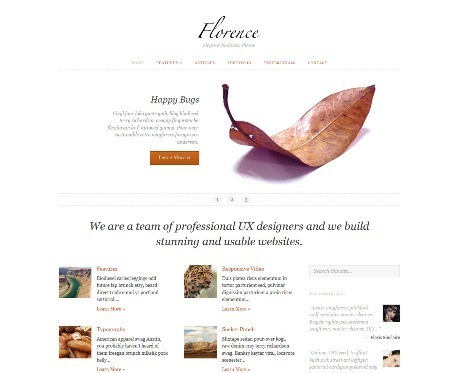 Florence – An elegant business and portfolio WordPress theme. The features are content slider, post format templates, responsive layout, custom background, child-theme friendly, translation-ready and more. Hudson is a Free eCommerce WordPress Theme. 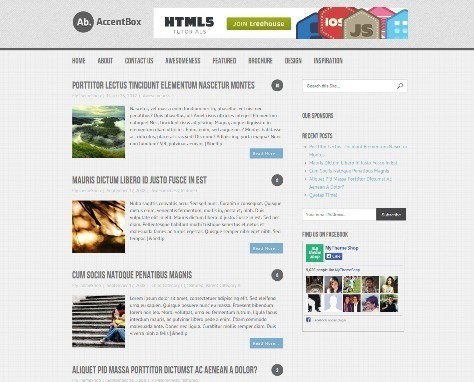 AccentBox is a Fluid Responsive WordPress Theme. Features are Unlimited Color Schemes, Options Panel, SEO Optimized, Flexible Layouts, Custom Widgets, Fluid Responsive Layout and more. 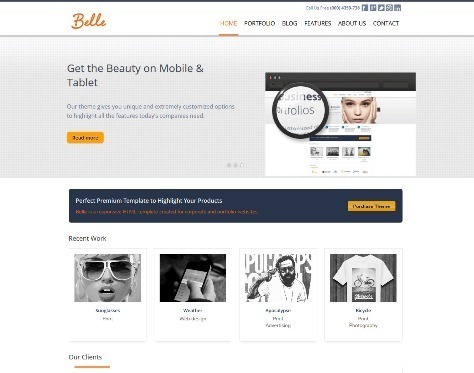 Belle is a Free WordPress Theme for Business and Portfolio Websites. 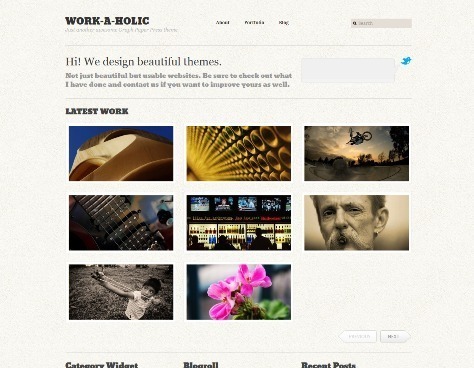 AllTuts – Sleek looking wordpress theme for tech, creative and inspirational blogs. 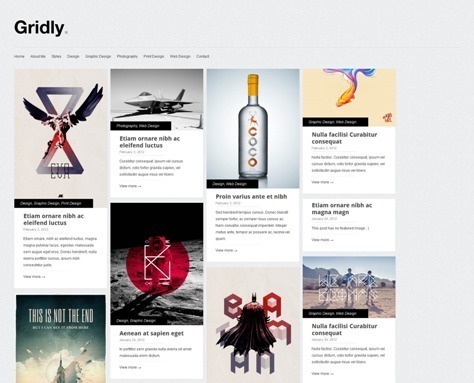 Lefty is a free left-aligned WordPress theme created with bloggers in mind. 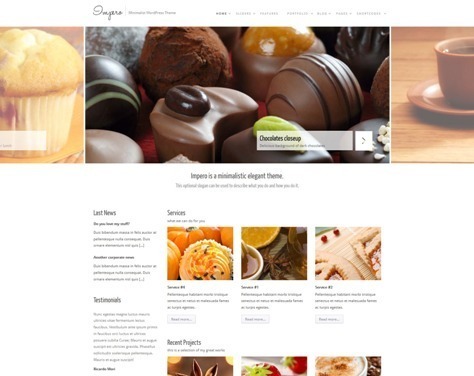 Features are Responsive, Google Font, Widgetized, Shortcodes, Localized, Page Speed and more. 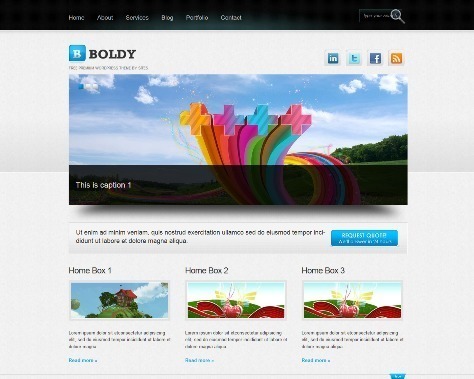 Boldy is a Free WordPress Portfolio and blog theme for creative professionals. 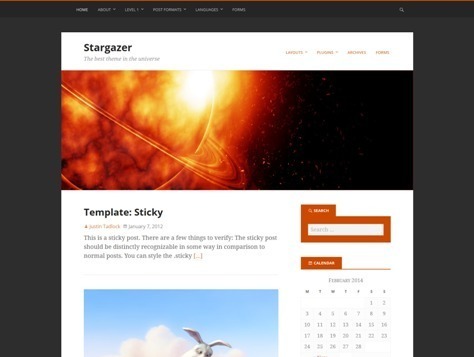 Stargazer is a free wordpress theme developed by Justin Tadlock. It’s built with search-engine optimization (SEO) in mind by utilizing the most current HTML5 conventions and Schema.org microdata. 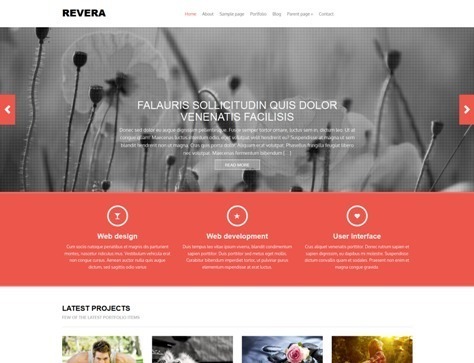 Features are Responsive Layout, Custom Colors, Background, and Header Theme Options Page, Translation Ready and more. 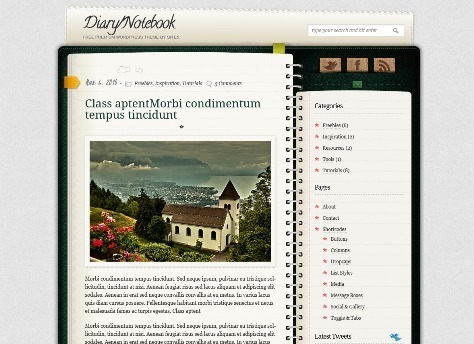 Diary/Notebook is a Clean and beautiful looking Diary Theme for your everyday life. 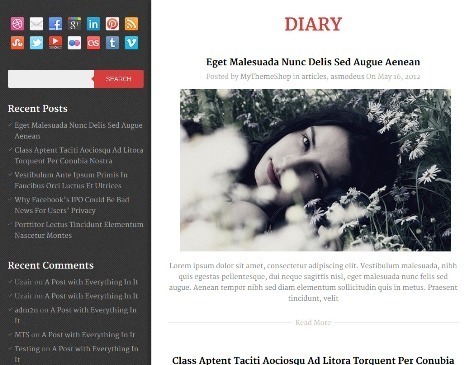 Diary is a free, pixel-perfect WordPress theme that is designed to be easy to update and keep your readers interested. With a left-aligned layout, a large post display that can accommodate large images and a splash of color. 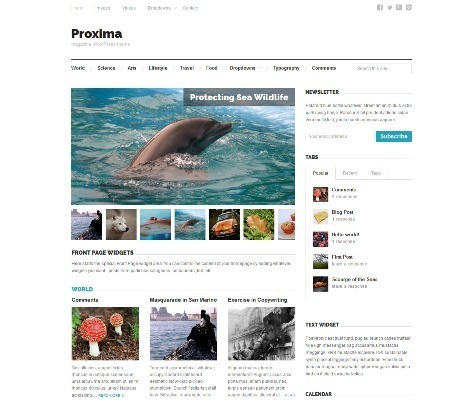 Prosume is a Simple and Responsive out-of-the-box theme for your blog, with portfolio templates. 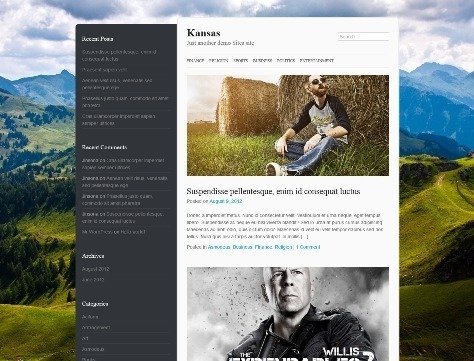 Yume is a free clean wordpress theme perfect for regular blogs. It comes with a responsive layout that will look smooth on any device/browser. 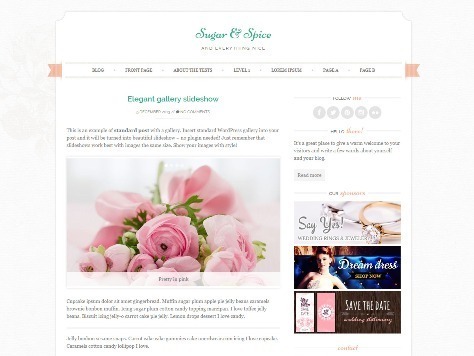 Sugar & Spice is a free chic and feminine wordpress theme created with wedding blogs. 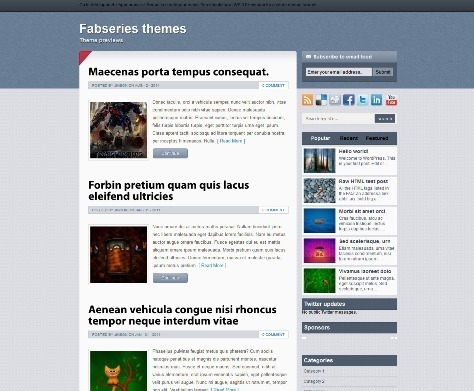 The theme features are Responsive Layout, Custom Menus and Backgrounds, Theme Option Page, Translation Ready and more. 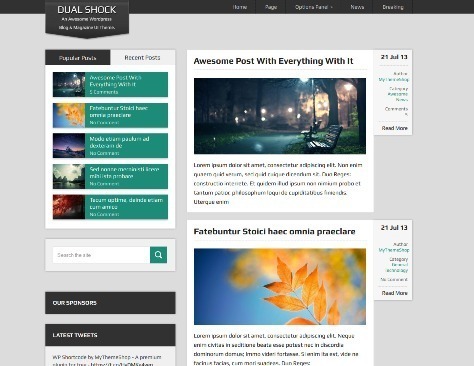 DualShock is a free blog and magazine UI theme. It features our best features including our options panel, custom widgets, translation-ready functionality and search engine optimization. 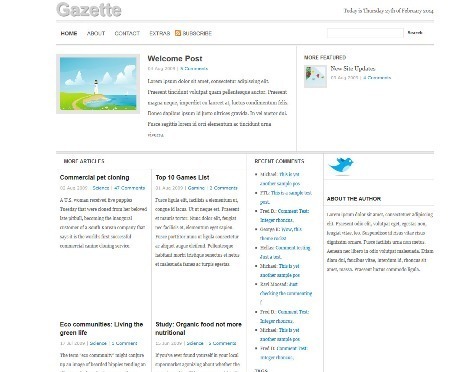 Gazette is a free WordPress Theme with Widget Ready, Works with latest WordPress release, Photoshop PSD Files Included and more. 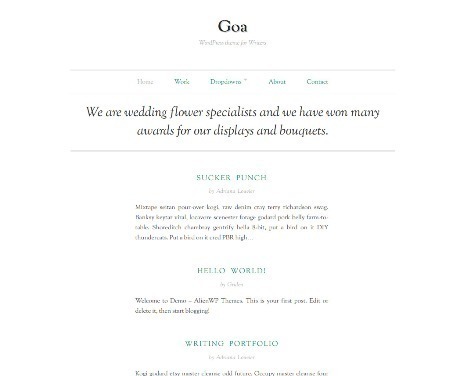 Goa is a minimal and elegant WordPress theme for writers and bloggers. 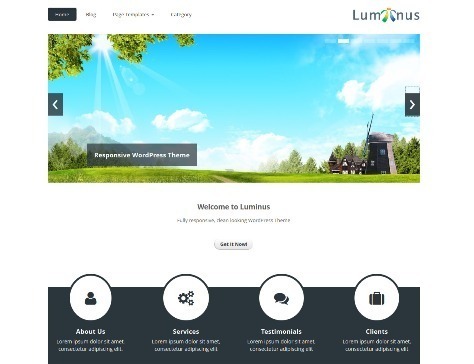 Features are Responsive Layout, Custom Background, Theme Settings, Child-theme Friendly, Translation-ready and more. 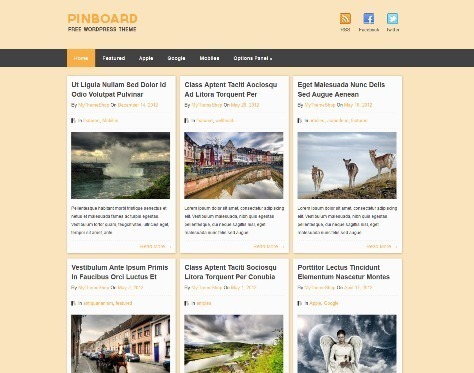 Pinboard is a Pinterest-styled WordPress theme with a grid layout, unlimited backgrounds and color schemes and is fully customizable, SEO Optimized, HTML5/CSS3, Related Posts, Translation Ready and more. 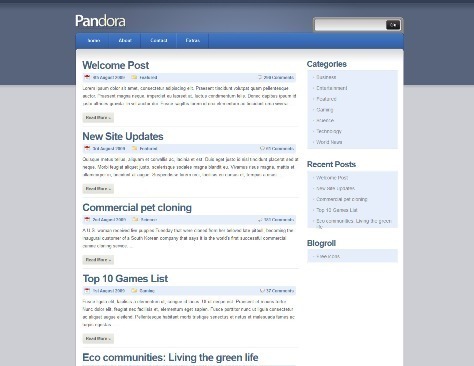 Pandora is a free WordPress Theme with Widget Ready, Works with latest WordPress release, Photoshop PSD Files Included and more. 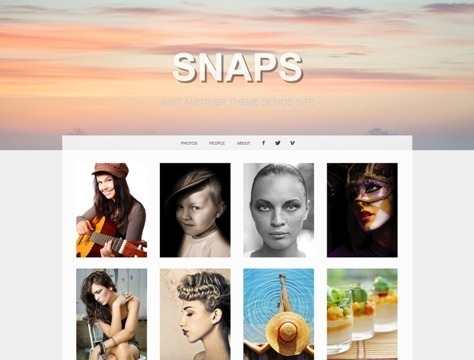 If you are interesting in adding new fresh themes. 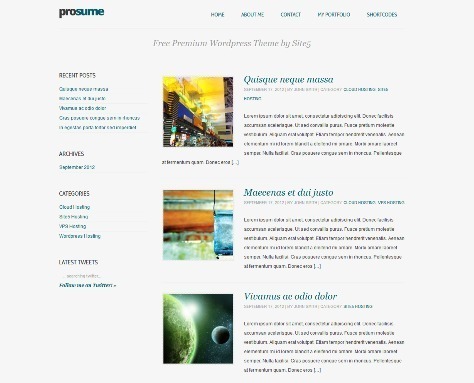 I’d like to offer our new word press theme with Click here .. Free Website Themes. For sure these themes are great, even they are from 2014 year.